Admin is a person who can manage and fully control the website. He/she has access to all settings, all user data and all other information concerning the site. This person decides how to drive the website and how to set it to function according to the business needs. Once you have created your site, you are automatically registered on this site as administrator. This means that you have all the power to operate your online deals business. As an admin, you can see 2 sides of your website – so-called front-end (the website's side from the user point of view) and backend (the admin section which you can use to modify your site). 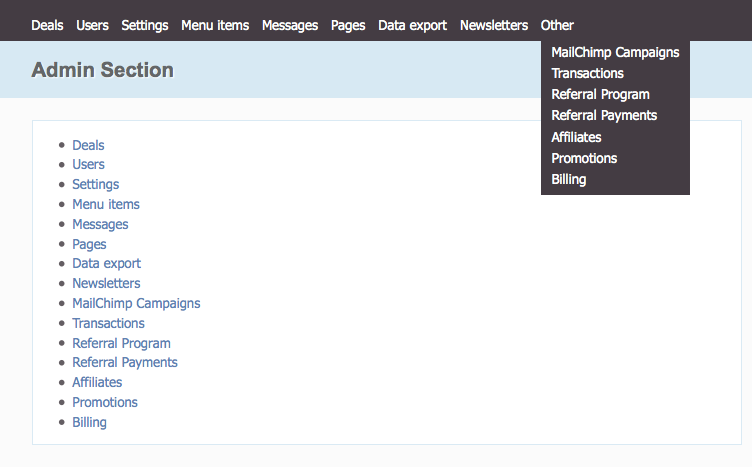 Admin section controls pages content, e-mails content, stored data (such as users, orders, etc. ), settings and a whole lot more. That is why we recommend you to go over your Admin section, modify and test all the functionality you have. There is a trial period that will give you enough time to understand whether Getsocio product fits your needs. By default there is only one admin on your site – the person who registered it. At some point you may decide to have someone who will help you to control your site. In this scenario you will need an extra admin account to give an access to Admin section for your business partner. The number of admin accounts is not limited, so you can grant admin permission to any user on your site. For this to happen, the user should register first (this is important, as you cannot create accounts from Admin section). After he/she registers through Sign up form, you should go to Users page in Admin section, click the needed user from the list and change the user role to Admin from the drop-down. Note: all admin accounts on your site have similar powers: extra admins can access, edit and download all the data that you can. That is why you must be sure that you fully trust the person whom you grant the admin access to.